At the top is a toolbar containing all available commands. Under the toolbar is a list of available items to perform actions on. The right pane contains information about the selected item in the list. Overview is a folder that displays getting started help topics. Enhancements are pre-built batch edits written by Mitinet™ to help you update and maintain your entire database. These enhancements are continually updated so your records always have the latest information when you run them. Global Edits are sets of instructions that describe what changes you want to make to your records and under what conditions you want the changes to happen. These are stored in the Private folder so you can refer to them later, or you can put them in the Shared folder to share with your colleagues. Note: The Private folder is hidden when it is empty. It will appear once you create a Global Edit, Workflow, or Selection. Likewise, the Shared folder will appear only when there are shared items. Workflows allow you to group Enhancements and Global Edits into a single action. Selections are a set of Conditions describing which records to add or remove from a List. Checkpoints allow you to save or undo changes you have made in BestMARC™ and view a side-by-side, before and after, comparison of your records. Click an item in the list to select it. Items with next to them have additional items inside them. Click the arrow or double-click the item to expand or collapse it. Collapsed folders are remembered between browser sessions on your individual computer. Name - Name of the selected item. Share - The name of the organization the selected item is shared with, or Private if it is not shared. Author - The creator of this item. Only the author or Account Manager is allowed to Modify an item (though others can Copy and modify the copy). If the Account Manager modifies an item, they become the new author. Modified - Date the selected item was last modified. Last Run - Date the selected item was last run. Folder - Information or help text detailing the type of items in the selected folder. Enhancement - Displays what the Enhancement does and where options for it can be set. Global Edit - The instructions that the global edit is configured to perform. 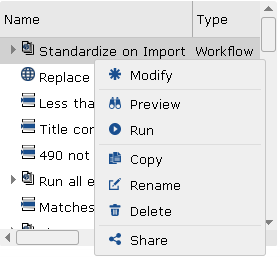 Workflow - Displays a list of Global Edits and Enhancements in the order they will run. Selection - The conditions under which a record is selected. Help topic - Displays help about the selected topic. The ☰ icon appears if there is not enough room to display all the icons. Click on it to display any hidden items. Click Refresh to update the list of items without reloading the entire page. Click New to create a new Global Edit, Workflow, or Selection. Select an item in the list and click Modify to open an existing item for review or modification. As a shortcut, you can double-click on an item to Modify it. Only the listed Author or the Account Manager can modify a selected item. When you are finished, click Save to save your changes or Cancel to close without saving. If it is new, you will be asked to enter a name for this item which is listed in the Private folder after saving. Enhancement - Click Run to run the selected enhancement on your records, using the options stored in your Profile. Enhancements cannot be previewed. Global Edit - Click Run to run the selected Global Edit on your records. Click Preview to view a side-by-side comparison of how your record will change when you run it. Workflow - Click Run to run the selected Workflow on your records. Click Preview to view a side-by-side comparison of how the Workflow will change your records when you run it. When enhancements are part of the workflow, they cannot be previewed. Checkpoints - Select a checkpoint item. Click Run to Update Checkpoints or Restore Checkpoints for all of your records. Click Preview to Compare Records which displays a side-by-side comparison between your current record and the checkpoint. We recommend that you Preview any new Global Edit or Workflow to ensure that they work properly before running against all of your records. Copy - Makes a copy of the currently selected item in the list. Enter a name for the copy and it is saved in the Private folder. Rename - Change the name of the currently selected item in the list. Enter the new name for the item. You can only rename items if you are the Author. Delete - Delete the currently selected item in the list. You can only delete items if you are the Author. Remove a Global Edit from any Workflows before you delete it. By default, the items you create are stored in your Private folder. Only you can run or modify those items. Select the organization you would like to share with or select Private to remove sharing. If the organization list is incorrect, contact technical support to update it. Click Share to save your changes. Shared items are shown in the Shared folder under the organization's name. All members of the shared organization can Run or Copy items in the shared folder. Only the listed Author or the Account Manager can Modify a shared item. Be aware that changing the shared item changes it for anybody who runs that item. Create a Workflow that automatically runs the Award Notes Enhancement, Subject Headings Enhancement, and performs 3 Global Edits for a particular vendor called Import Vendor A records. Share the Import Vendor A records workflow with your organization so every time anybody gets a new file from Vendor A, they can import it with this Workflow. If you later discover that Vendor A records need additional processing, Modify the Import Vendor A records workflow to perform the additional work without needing to notify the rest of the staff. The updated workflow allows your staff to continue to run Import Vendor A records with the additional processing automatically. Click to change how the items in the list are sorted throughout BestMARC. Alphabetical - The sort button shows an A-Z icon when sorted alphabetically. 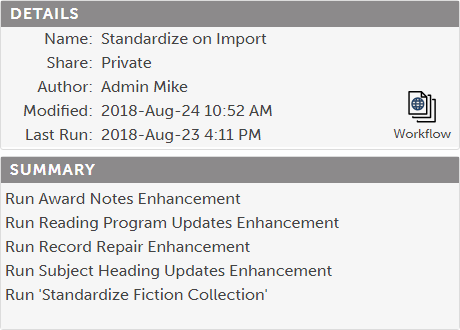 Most Recent - The sort button shows a date icon when sorted by most recent modified or run date. Tip: Use Most Recent sorting to make it easier to find Global Edits in the order you create them. Your most recently created items are always at the top of the list.